A lot of work Wendy, but worth it if you get a good crop! I just don’t know where you get all your energy from! Your landlord is letting you plant a garden? Wow! You’re lucky. Have fun! This looks better than the last spot, and like more room too. I can’t wait to see how it grows. Gosh that’s a good space for vegies. You’re going to be able to fit heaps in there. I can almost imagine Marko thinking – look at all that great digging space! Gen – Me too. Expect more courgettes! Susan – He is. He’s a friend of my family though so it’s a not a normal landlord/tenant situation. Jane – Shall take a look as soon as my computer stops being weird. Thanks in advance! Christina – It’s infinitely better in terms of light and space and views. Much happier. Kathryn – There will be a fence erected very soon to keep Marco Barko out of there! This looks like a really good patch Wendy. You’ve got a lovely landlord letting you dig up the front garden! I’ve bought a couple of raised beds this year and am attempting to do something akin to the square foot gardening link Jane mentions. Can’t wait to have something homegrown to eat. Sophie – He is rather understanding! Good luck with the raised beds. Do post about how it’s going! 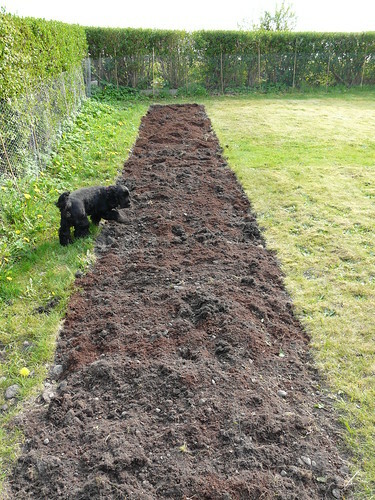 Yes – that soil look quite nice. Rich and dark; I can see lots of lovely green things flourishing there! Good choice. Nice landlord! And best of luck with the garden. I have given up my tomatoes since Cosmo (one of my labs) began lifting his leg on every plant in the garden. Oh well. Looking forward to seeing what you’ll plant!